BACKGROUND: Matlab, a powerful and productive language that allows for rapid prototyping, modeling and simulation, is widely used in computational biology. Modeling and simulation of large biological systems often require more computational resources then are available on a single computer. Existing distributed computing environments like the Distributed Computing Toolbox, MatlabMPI, Matlab*G and others allow for the remote (and possibly parallel) execution of Matlab commands with varying support for features like an easy-to-use application programming interface, load-balanced utilization of resources, extensibility over the wide area network, and minimal system administration skill requirements. However, all of these environments require some level of access to participating machines to manually distribute the user-defined libraries that the remote call may invoke. 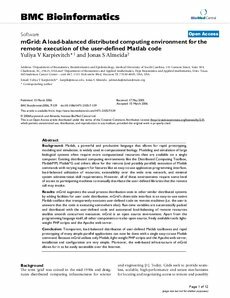 RESULTS: mGrid augments the usual process distribution seen in other similar distributed systems by adding facilities for user code distribution. mGrid's client-side interface is an easy-to-use native Matlab toolbox that transparently executes user-defined code on remote machines (i.e. the user is unaware that the code is executing somewhere else). Run-time variables are automatically packed and distributed with the user-defined code and automated load-balancing of remote resources enables smooth concurrent execution. mGrid is an open source environment. Apart from the programming language itself, all other components are also open source, freely available tools: light-weight PHP scripts and the Apache web server. CONCLUSION: Transparent, load-balanced distribution of user-defined Matlab toolboxes and rapid prototyping of many simple parallel applications can now be done with a single easy-to-use Matlab command. Because mGrid utilizes only Matlab, light-weight PHP scripts and the Apache web server, installation and configuration are very simple. Moreover, the web-based infrastructure of mGrid allows for it to be easily extensible over the Internet.